Register for ATS and Engineers as Educators Today! The American Institute of Aeronautics and Astronautics (AIAA) Houston Section, in collaboration with the Human Systems Integration (HSI) Employee Resource Group, is proud to host the 2017 Annual Technical Symposium (ATS) on Friday, May 5, at 8 a.m. at the Gilruth Center. Come hear presenters discuss their work while networking with others in the AIAA and HSI community. 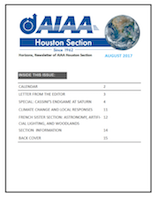 It’s $20 for AIAA members and $25 for non-AIAA members. A lunch buffet is included in the registration cost. Continental breakfast (including coffee) will be provided in the Gilruth Alamo Ballroom during registration. The Engineers as Educators Workshop will teach you to inspire students about the marvels of aerospace engineering. Share your passion in a manner students can relate to. Register now for the Engineers as Educators Workshop, and you’ll walk away armed with the tools to help plan and execute powerful experiences and excite the next generation of engineers. This event will be during the AIAA Annual Technical Symposium, but needs to be registered for separately on the registration Web page. It is a FREE event, and symposium registration is not required. Register for one or both events on the event page or the Eventbrite page. Join the AIAA and the JSC Human Systems Integration ERG for Annual Technical Symposium on Friday, May 5, 2017 at the NASA JSC Gilruth Center. Submit your abstract today and see the ATS 2017 page for more information. The new date for the Annual Technical Symposium is Friday, June 5. Register today for the 2015 Annual Technical Symposium (Friday, June 5, 8:00am, NASA/JSC Gilruth Center)!